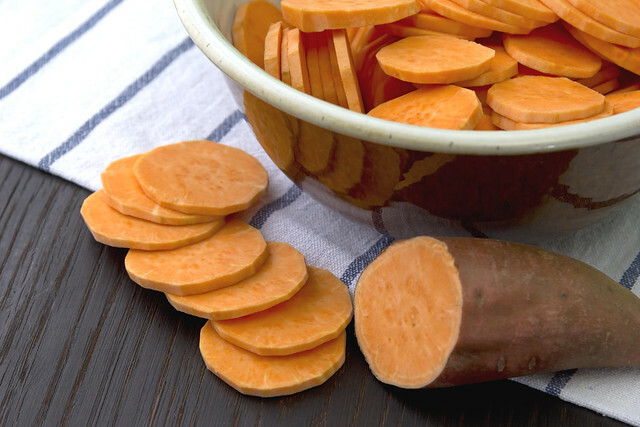 Sweet potatoes, which are native to the Americas, sustained our founding pioneers with beneficial nutrients like beta carotene, calcium, fiber, and a host of vitamins. No wonder it’s a holiday favorite, especially during Thanksgiving. But what makes a good sweet potato? USDA scientists know what it takes to make a good sweet potato, whether you like it in pies and custards, baked, as chips or French fries, and even juice or smoothies. Together, researchers with the Sweetpotato Breeding Program at North Carolina State University (NCSU) and the USDA-Agricultural Research Service (ARS) develop sweet potato varieties for improved color, flavor and texture—testing them for sugar, starch, beta carotene, anthocyanins and other characteristics that appeal to consumers’ appetites. Truong provides a wealth of information about sweet potato production, different varieties, genetics, storage, packing for fresh root markets, and technologies for processing into consumer food products and functional food ingredients for the food industry in his chapter in the recently published Handbook of Vegetables and Vegetable Processing, 2nd Edition. The chapter also details the nutritional quality of raw sweet potatoes and the processed products. ARS scientists work closely with NCSU researchers, developing new varieties for commercial production that have high yields and nutritional value; are more disease and insect resistant; and can be stored for longer periods for fresh root markets and the food processing industry. Additional research involves testing new varieties for consumer preference. FSRU food technologist Suzanne Johanningsmeier recently showed the high potential for consumer acceptance of Evangeline, a new sweet potato variety, because of its intense orange color, flavor, and moist texture. “It came as no surprise that consumers preferred both Covington and Evangeline sweet potato varieties oven baked compared to cooking in the microwave due to more sweetness and flavor development and softer textures,” Johanningsmeier says. “We always focus on what the American consumers would like,” Truong says. “We target the orange flesh color, which is very rich in beta carotene.” Sweetness—increasing the sugar content—and texture also are important traits. ARS scientists are also evaluating purple-fleshed sweet potato varieties with high anthocyanins and antioxidants for home cooking and processed foods as well as natural colorants. Desired sweet potato characteristics vary somewhat depending on how they’re prepared. For making pies, scientists develop varieties that make a good puree—not too viscous, sticky, or hard to mix after cooking. For fries and chips, sweet potatoes should have higher dry-matter content for good texture, low reducing sugars, and free amino acids for less browning and low acrylamide formation during frying, Truong says. Scientists believe that the sweet potato was domesticated more than 5,000 years ago, but there is debate as to whether this took place in South America or Central America. However, everyone agrees that the sweet potato ranks as one of the healthiest vegetables because of its high levels of vitamins A and C, iron, potassium and fiber.